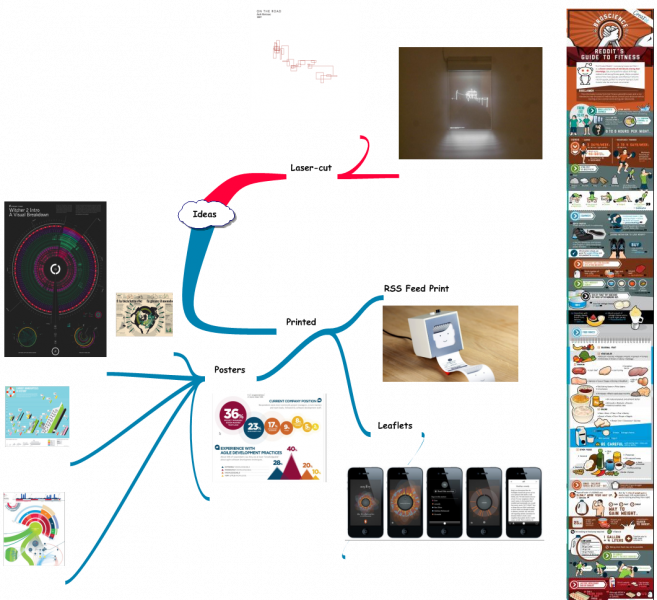 We did some research to find some inspiration for our idea, and basically where we could take the project next. Our most significant find was the work by Simon Faithfull, which we saw at an art exhibition held at our University recently. 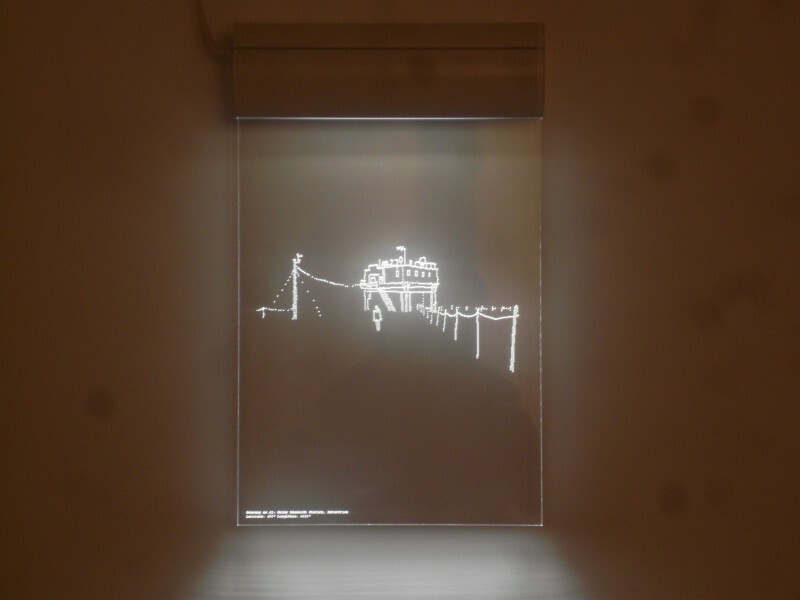 The installation was of lit Perspex displays depicting travels he had undertaken. This gave us the idea to create a Perspex light-box to display the data of user’s fitness. The device could be laser-cut with LEDs to provide the light through the Perspex. Another significant artist was that of, Info-Graphic designer, Stefanie Posavec. She created a project a called ‘First Chapters’ in an attempt to represent the differences in writing style between authors. The artwork was formulated by the number of words per sentence of a passage of writing; each left tangent is a new sentence. The representation showed that a book with shorter sentences had tighter display of lines. We could represent the data we obtain in the same method. For example, a line drawn from the heart rate data would change at a tangent whenever the rate goes above and below 60bmp; the more vertical the image, the more active the user. Other work we look we studied were of info graphics and posters that promoted fitness. One more interesting discovery was Berg’s Little Printer, which prints out a custom made RSS feed for you to read; it prints something similar to a receipt. 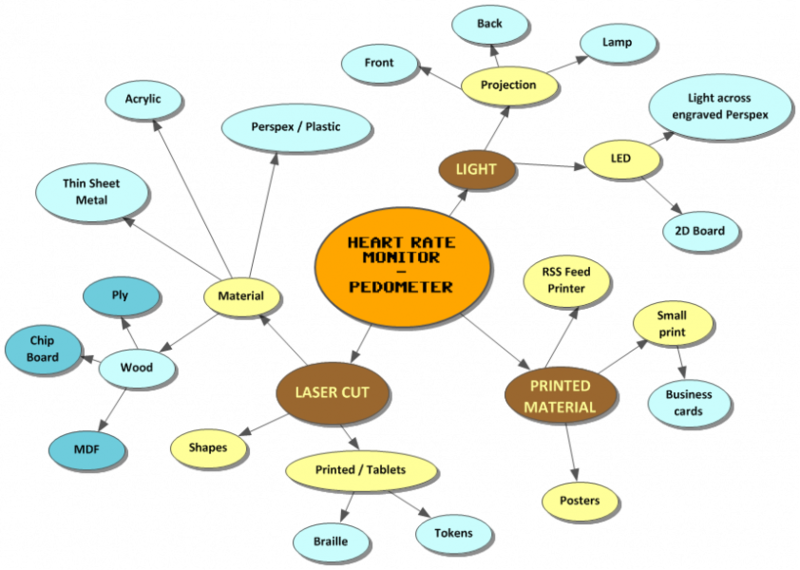 Research was also carried out to find out how we would create the Pedometer and a Heart Rate monitor. An Arduino is going to be used to record the data from users, but there is not enough onboard memory, so a new EEPROM needs to be bought. 20 pedometers for £5 was bought to attach to the Arduino. We figure (from researching) to create a working heart rate monitor, an Infrared LED and receiver will be able to record the differential of blood flow when placed next to the skin. The hit TV show Dexter was the inspiration for the tray of slides. Dexter is a serial killer and each kill he carries out, he keeps a microscopic slide of their blood. Instead… will print the user’s heart and step data onto the slides. RE: Suggest for pedometer sensor?